Check-in and activities start at 11:00 a.m. Walk starts at 1:00 p.m.
Local 22 & Local 44 are proud sponsors of the American Cancer Society in Vermont. The American Cancer Society is here to help. We have programs and services in your community to help people with cancer and their families. Our programs offer information, day-to-day help, and emotional support. To learn more about these programs, and others, contact us 24 hours a day, seven days a week at cancer.org or 1-800-227-2345. Trained cancer information specialists are available around-the-clock to answer questions about cancer, including information on diagnosis and treatment, and to link callers with resources in their communities and nationwide. This user-friendly site provides in-depth information on every major type of cancer, as well as an email service to help answer your questions. The American Cancer Society Road To Recovery® program provides free rides to cancer patients to and from treatments. Trained volunteer drivers donate their time and the use of their personal vehicles to help patients get to the treatments they need. The American Cancer Society Hope Lodge, Lois McClure-Bee Tabakin Building in Burlington, VT offers free, temporary accommodations for cancer patients and their families who must travel far from home for treatment. Learn more about Hope Lodge by visiting cancer.org/hopelodgeburlington. The American Cancer Society Patient Navigator Program and cancer resource centers in Vermont can help guide patients and families through their cancer experience. Look Good Feel Better® workshops help women with cancer learn simple hair and skin care techniques to manage the appearance-related side effects of treatment. The program is a collaboration of the American Cancer Society, the Personal Care Products Council Foundation, and the Professional Beauty Association. The American Cancer Society Reach To Recovery® program matches trained volunteer breast cancer survivors to people facing or living with breast cancer. Our volunteers give cancer patients and their family members the opportunity to ask questions, talk about their fears and concerns, and express their feelings. The American Cancer Society Cancer Survivors Network® is a free online community created by and for people living with cancer and their families. You can get and give support, connect with others, find resources, and tell your own story. Visit csn.cancer.org to access this resource. The American Cancer Society is a global grassroots force of 2.5 million volunteers saving lives and fighting for every birthday threatened by every cancer in every community. 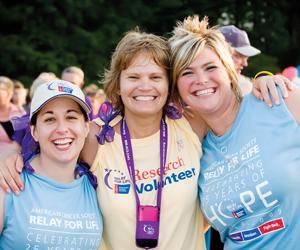 Join us and discover how rewarding it is to be an American Cancer Society volunteer. Visit cancer.org/volunteer to learn more. The American Cancer Society Relay For Life movement fights for a cancer-free world. 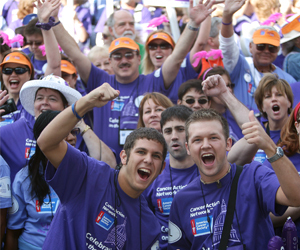 Join more than four million participants in more than 5,000 communities nationwide to finish the fight against cancer. At 12 community Relay For Life events in Vermont, teams of registered participants camp out at a park, school, or fairground, and walk around a track or path - sometimes overnight - to symbolize the battle waged around the clock by those facing cancer. Thoughtful ceremonies, including the Luminaria Ceremony, are held throughout the duration of the event to honor cancer survivors and caregivers, remember loved ones lost to the disease, and fight back against cancer. Join the Relay For Life movement and finish the fight against cancer! 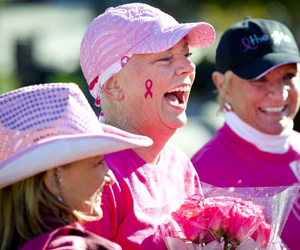 Your support as a participant or event volunteer enables the American Cancer Society to save lives. Visit Relayforlife.org to find an event near you! Making Strides Against Breast Cancer walks are the largest network of breast cancer awareness events in the nation, uniting nearly 300 communities with a shared determination to finish the fight against breast cancer. Passionate walk participants raise critical funds that enable the American Cancer Society to fund groundbreaking breast cancer research; provide free, comprehensive information and support to those touched by breast cancer; and help people take steps to reduce their breast cancer risk or find it early when it is most treatable.